Becoming a pop culture icon is a difficult thing to achieve but Scott “Carrot Top” Thompson has done just that. With over two decades of comedic performance in his rear view mirror, Carrot Top is one of the most popular, recognizable and successful comedians in America. After years of playing out to sold-out shows throughout the country, he has now become a Las Vegas icon as well, recently inking a long-term deal with the Luxor Resort and Casino. That start came when he was a student at Florida Atlantic University in Boca Raton, Florida. His freshman year he went to a club and saw live stand-up comedy for the first time. A couple of months later the campus bulletin board announced an open mic night. “I wasn’t going to do it but my roommate convinced me. He said ‘You’re funny.’ I was scared and did some old jokes but people liked it.” His second attempt brought his first prop to the stage. It was so well received that he found another prop that brought a great crowd reaction and then another that did the same. The rest is comedy history. After building a following on the comedy circuit that had him making people laugh nearly every weekend, his first television appearance was on “Comic Strip Live” in 1991. Things changed for Carrot Top forever in 1992 with his first appearance on “The Tonight Show.” That appearance exposed his unique brand of comedy to every home in America and there have been almost 30 appearances on that show alone since then. 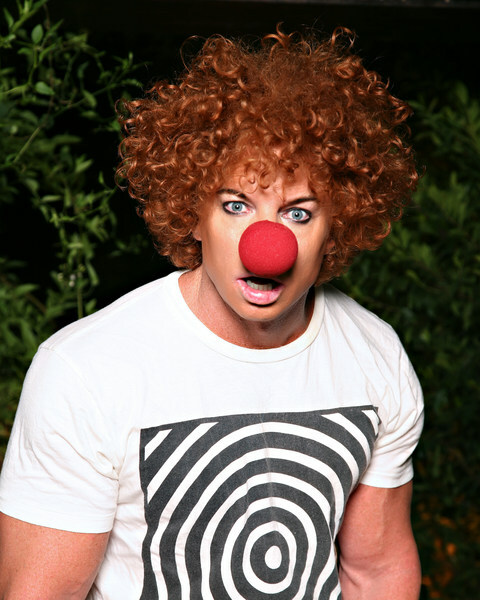 Carrot Top’s other credits include hundreds of TV programs including “Live with Regis and Kelly,” “Politically Incorrect with Bill Maher,” “The Late, Late Show with Craig Ferguson,” “Late Night With Conan O’Brien,” “Gene Simmons’ Family Jewels,” “Cheslea Lately,” “Last Comic Standing,” “Criss Angel—Mindfreak,” ESPN commercials, as well as the American Movie Classics’ presentation of “Three Stooges” shorts. He also starred in his own movie Chairman of the Board and performed in Dennis the Menace Strikes Again among other films. He also began to dabble in movies, television production, commercials and writing. Carrot Top has starred in his own movie, “Chairman Of The Board,” and has made numerous appearances in other films including “Dennis The Menace Strikes Again.” He produced “Carrot Top’s A.M. Mayhem” on the Cartoon Network. His ad campaign for 1-800-CALL ATT ran for over three years and only further helped to keep his face on televisions across America. In 1996, his Simon and Schuster book “Junk In The Trunk: Some Assembly Required” was a retrospective of Carrot Top inventions. Two years ago came the move that every comic hopes to make, a regular gig on the Strip in Las Vegas. After headlining at MGM Grand for 15 weeks a year, he has now signed a very lucrative and long-term deal with the Luxor Hotel and Casino. He performs almost 300 shows a year in the Atrium Theatre. Fans have flocked to se his show because it remains as current as today’s headlines, consistently poking fun at pop culture, politics, music and whatever the real world has to offer. No one is safe from the “King of Props” hilarious and infectious humor.